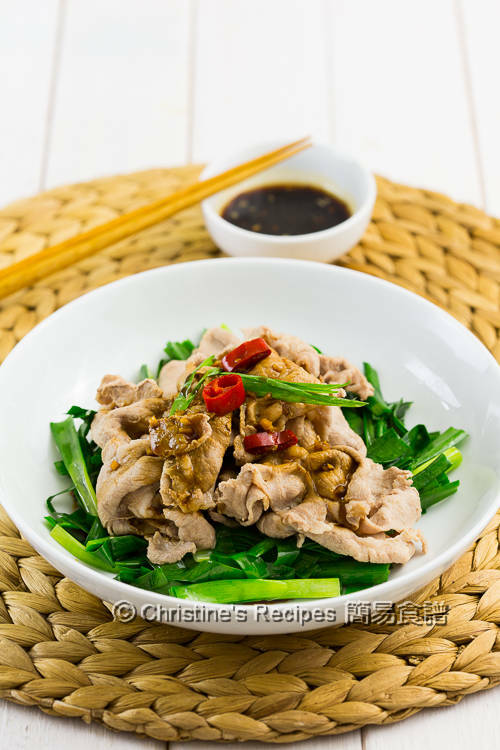 Looking for some quick and delicious dish ideas? 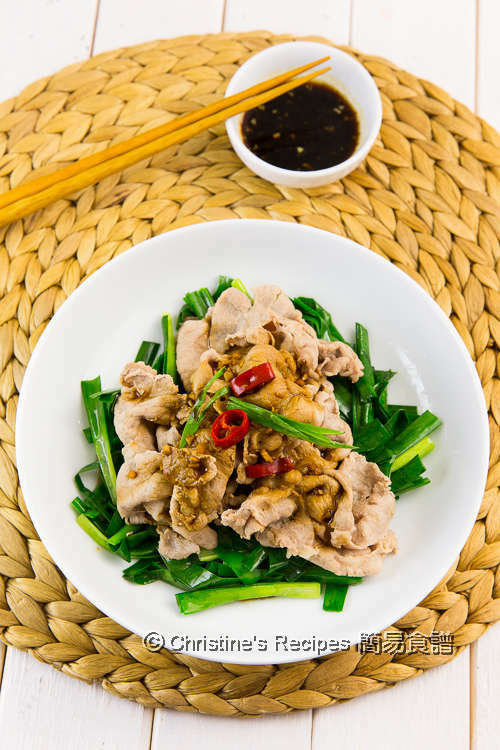 This boiled pork slices with garlic sauce is what you’re looking for. I made this dish when the weather was scorching hot down under here. I didn’t need to stand very long next to a hot stove. 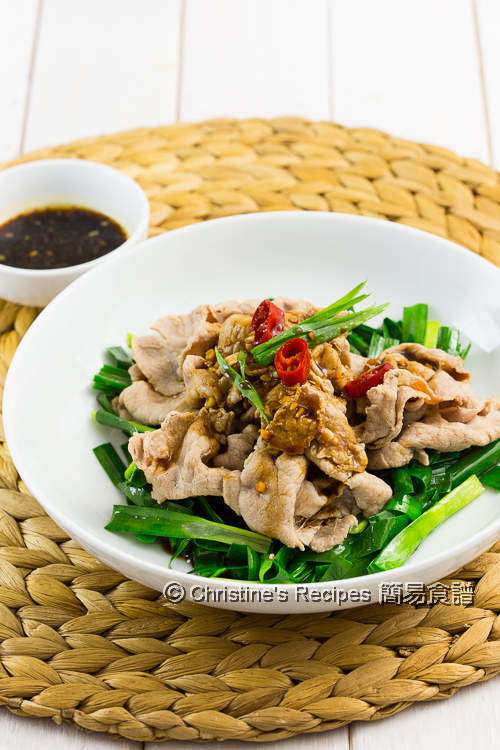 This appetizing and refreshing dish can be done within 10 minutes. You’ll find the preparation is absolutely minimal. The pork I used were those already sliced for Shabu-shabu (Japanes hot pot) from a nearby Asian grocer. It’s frozen. It only takes 10 minutes or so to get them thawed at room temperature and ready to use. Shabu-shabu pork is commonly served as a winter dish. Why not boil some to make a refreshing summer dish? Not harm at all. I’ve got some leftover chives in my fridge. Chives go so well with pork and taste wonderfully with the sauce. The aroma of chives and garlic takes the whole dish up a level. You can use other kind of vegetables that come in handy to you though. Saute garlic over medium high heat. Pour in all the sauce ingredients and cook until the sugar is dissolved. Remove from heat. Bring a pot of water to boil. Add 2 teaspoons of oil. Cook the chives for 1 minute, until they turn dark green. Immediately drain up. Arrange on a serving plate. 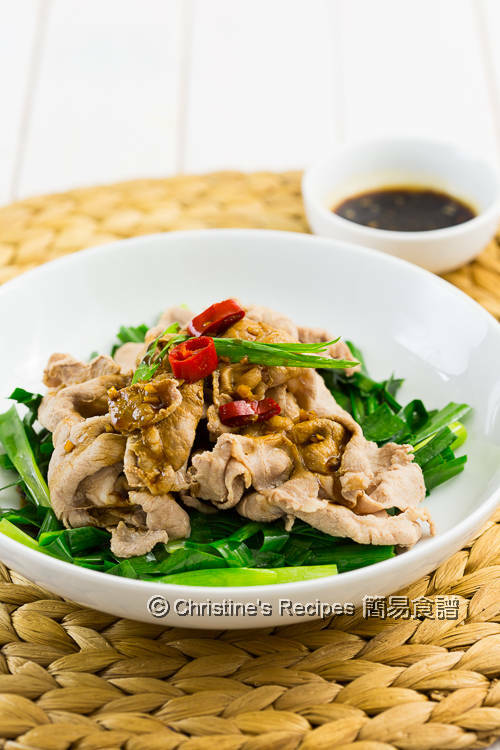 In the same pot, cook the sliced pork until it’s thoroughly cooked. You shouldn’t see any pink colour. Drain up. Place on the bed of chives. Serve with the sauce. Garnish with red chilli if using. Enjoy! 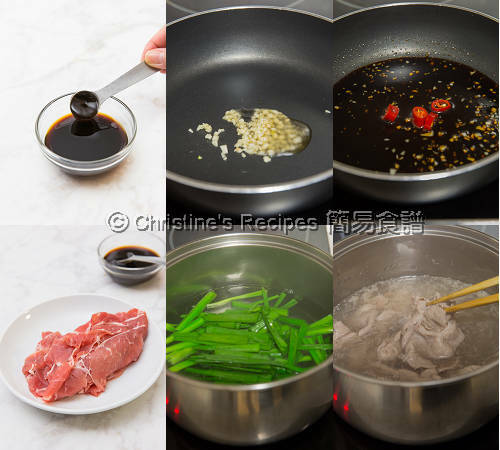 I used the thinly sliced pork for Shabu-shabu (Japanese hot pot), available from Asian grocers. It’s very handy. The highlight of this dish is the sauce. It’s just balanced and tasty. Make more of it if you like. Don’t overcook the chives. Once it turns dark green, quickly drain it out to keep its crispy texture. You may use cucumber or been sprouts instead.